A quick and easy roast for midweek or Sunday lunch with hardly any washing up! 1 Preheat the oven to 200°C/180°C fan/gas mark 6. Place the butter in a bowl and beat in the garlic, mixed herbs and the zest and 1 tbsp juice from one of the lemons. Season with salt and freshly ground black pepper. 2 Ease the skin away from the chicken thigh portions and gently push about 1 tsp of the herb and garlic butter under the skin of each portion then smooth the skin back down. Place all the chicken portions in a large roasting tin. 3 Toss the potatoes in half the olive oil and season. Scatter around the chicken along with the rosemary sprigs. Cut the second lemon into thin wedges and nestle them in between then chicken and potatoes. Drizzle over the rest of the olive oil. 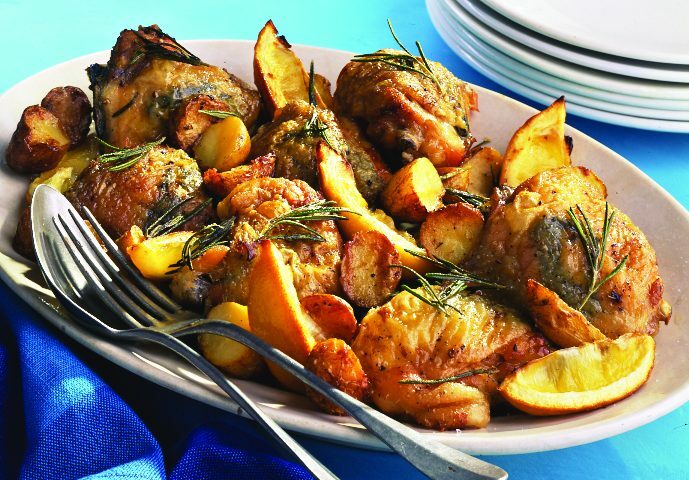 4 Roast in the pre-heated oven for 55 minutes to 1 hour 15 minutes until the chicken is golden and cooked though and the potatoes are crisp and tender, turning the potatoes and basting the chicken with the pan juices once or twice. Serve from the roasting tin with steamed green vegetables, if liked. 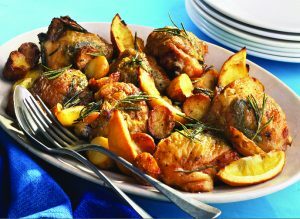 You can use any combination of mixed herbs for the garlic and herb butter – thyme, parsley and oregano all go particularly well with chicken. Or just choose one strongly flavoured herb such as tarragon.